Over the past year we’ve been working on a series of law firm website design projects, three in London and one in California. This is proving a particularly interesting new sphere of business. In fact working with legal businesses is an area we’re really interested in expanding as time passes. Working with law firms feels a natural extension of our work with financial companies such as Mansford, Montrose Capital and Longwall Ventures that we’ve acted for over the years in various different capacities. The fascinating thing for us about this new brace of projects (three are complete, one is a work in progress) is just how varied each approach and brief has been from a profession where one would imagine consistency. Not so. On reflection, this is not a huge surprise because each client has come to us through such varied circumstances. Additionally, in nearly every case they cover a totally different field of the law. In fact even when we acted for two firms that work in similar fields (employment law), ‘difference’ was the order of the day as one was based in Lincoln’s Inn and the other… Beverly Hills. If I was looking for a blanket term to describe all our legal clients, professionalism would be it. In fact it is we who have had to deploy the consistency. It was this unexpected and interesting series of experiences that inspired this piece that could even become a series – on best practice when specifiying, designing and ultimately chosing content like images and copy for a new law firm website design. A plan is always a good start to any project, I tend to think. This is particularly true of website projects where structure and logic are at the heart of understanding what clients will be looking for. Anticipating the priorities of a law firm’s clients is usually second nature to the partners and associates of a firm. The next step for us, translating this knowledge into how these same users may potentially browse a website, is invaluable to us in devising the best possible layout of the information and flow through the pages. Our outline at the beginning of the project is to condense this information into a site map, or structure of all pages in the website. It’s a simple approach, but means that the brief for a copywriter, photographer and designer is immediately clear in terms of the volume of content that will be needed. Particularly for the copy, it will also indicate the level of detail required in detailing services. It’s ironic given its apparently simplicity, but agreeing a sitemap is often the most prolonged part of the process as it is always discussed in such depth, but such considered preparation is rarely time wasted. We often focus on the end at the beginning. What I mean by this is that anticipating how to promote a website is particularly important when writing the site map. We advise considering the firm’s specialisms and how clients and potential clients might search for them. Often the search terms themselves are key here, potentially combined with the firm’s name or location. The end result can mean more detail not less. While we always try and advocate simplicity in a site, sometimes more pages (each featuring a specific individual service) works better than cramming too much information onto just one. Following go-live, many firms choose to just leave it there – and intense online marketing isn’t for everyone. But particularly for newer practices, quietly waiting for new business to come knocking isn’t an option. 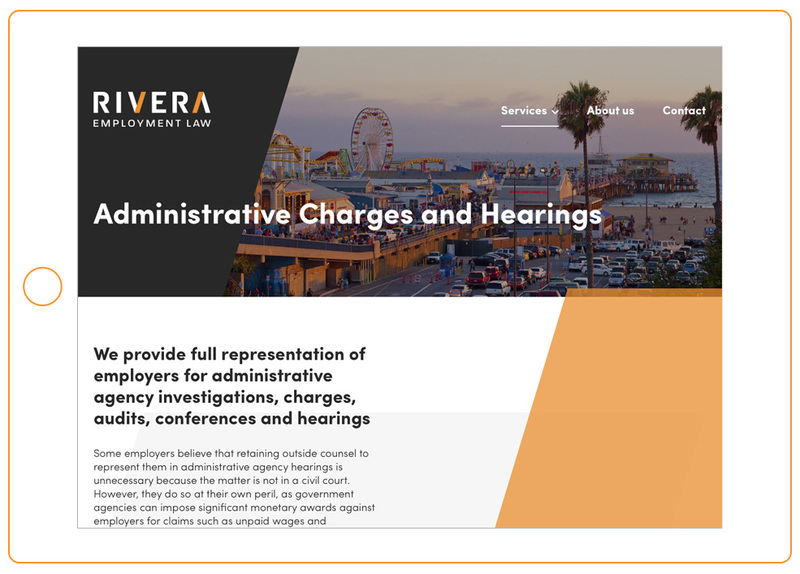 … and this is where having a sensible site map where each of the firm’s core services is mentioned in detail (as below in the example of our work for Rivera Employment Law) really pays dividends. We believe that once a site is completed, keeping it fresh is central to its success as an investment. One good example to keep an eye on is areas which list clients. Needless to say this isn’t always possible because of non-disclosure agreements, but where it is, these should be amended in turn. Client testimonials are also a good idea – particularly as these can be made anonymous. It’s remarkable the difference a positive opinion can make to attaining new clients, particularly when legal matters are more personal rather than corporate. Beyond that, many law firm websites request sections featuring ‘latest press releases’ and News areas. Including regular commentary relevant to your industry or sector in these is incredibly important. These pages may seem frivolous or without specific aim, but keeping fresh content at the heart of the site is vital. It has the effect of search engines ranking the site higher – and will mean potential clients visiting the site receive the impression that the business is vibrant, professional and modern in outlook. No bad thing for a law firm in 2016. INTERESTED IN WORKING ON A LAW FIRM WEBSITE DESIGN PROJECT WITH US? 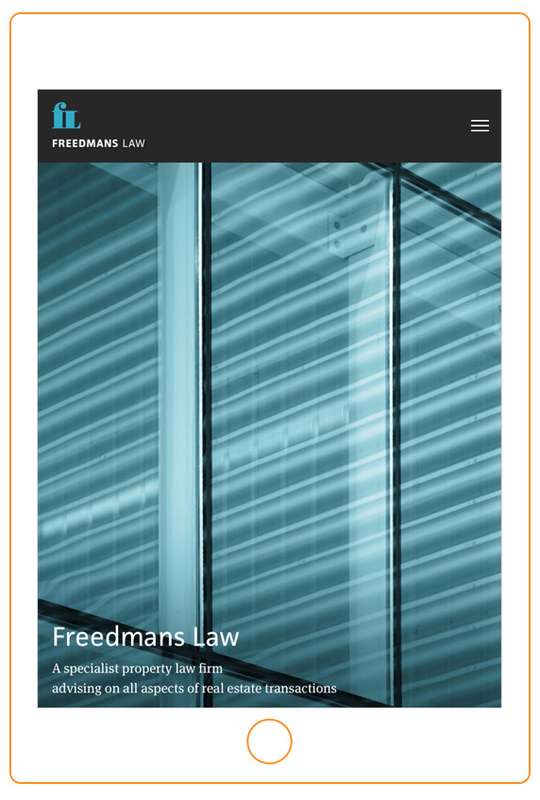 As we increase our legal client base, we’re interested in talking with more law firms about how they can approch their web presence in a better, more effective way.